A pioneer of life sciences at University of Dundee, D’Arcy Thompson was one of the great interdisciplinary thinkers of his time. His book ‘On Growth and Form’ (1917) pioneered the science of biomathematics and is hailed as “the greatest work of prose in twentieth century science”. It has influenced scientists, artists, architects and engineers from around the world. D’Arcy Thompson’s book ‘On Growth and Form’ sports a nautilus shell on its cover and alongside rock roses, these both showcase just some of the beautiful patterns that are often formed in nature. Jellyfish and tiny sea creatures called lagena were found in his drawings demonstrating these patterns too. Snowflakes reflect organic form and many morphing graphs of fish and more were found in his books. When I went to an exhibition about Thompson at the Dundee Science Centre I found out that there are many stories told of him walking around Dundee with his pet parrot on his shoulder, the parrot skeleton represents this personal detail and the zoology museum too. I also found this picture of D’Arcy with a parrot skeleton. Isn’t it brilliant! I did a lot of research for Thompson’s plaque and found so many different creatures and plants that I could have included, it was so hard to choose. I looked closely at the nautilus shell in particular, how they grow and the mathematics behind it to try and recreate it as accurately as I could. Sketching rock roses: these plants represent the work he did on morphogenisis, which is all about how the patterns in plants and animals are formed and more specifically phyllotaxis, which is the botanical study of how leaves are arranged on plant stems and how they will often form spirals. If you have ever heard of the fibonacci sequence, a lot of work in this area stems from D’Arcy’s work and his famous groundbreaking book ‘On Growth and Form’. If you had asked me a few years ago what lagena were I wouldn’t have had a clue. I would also have thought that these beautiful microscopic sea creatures were Christmas baubles too had I been shown pictures out of context. They were too beautiful not to include on the plaque and also something that I hope would make people wonder and want to find out more. When leafing through his work you can find a number of these detailed lagena diagrams all linking back to work on how cells are formed and why this makes such a difference in shapes in nature. I fell in love with drawing jellyfish whilst creating D’Arcy’s plaque, aesthetically they seemed to provide the perfect balance in his plaque. Their flowing shapes and delicate beauty were just what I was looking for to balance the bulkier shapes of the shells, rock roses and lagena and acted as a lovely link to help the eye flow around the illustrations. I enjoyed drawing jellyfish so much after working on Discovery Walk that they also now appear on Oor Wullie’s arm. I have painted one of the Oor Wullie sculptures for the Oor Wullie Bucket Trail which is titled ‘The Adventure Of Discovery Never Ends’, after Discovery Walk and his whole arm is dedicated to D’Arcy Thompson. Others from the walk also appear. 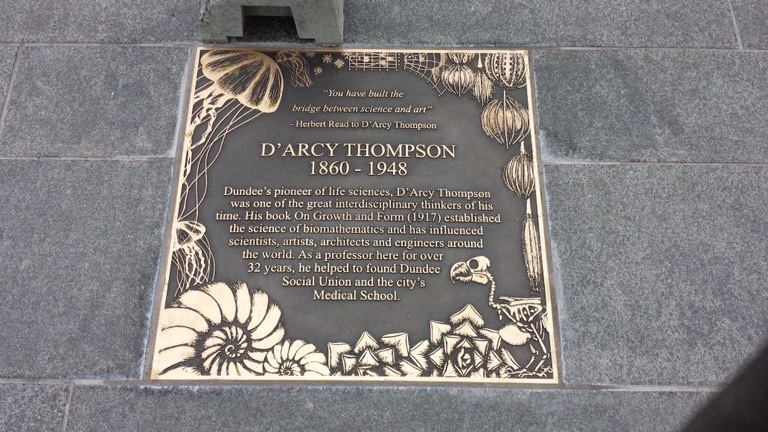 When looking more closely at D’Arcy Thompson’s work it is easy to see how this amazing man has inspired so many generations of scientists, mathematicians, artists, architects and more. 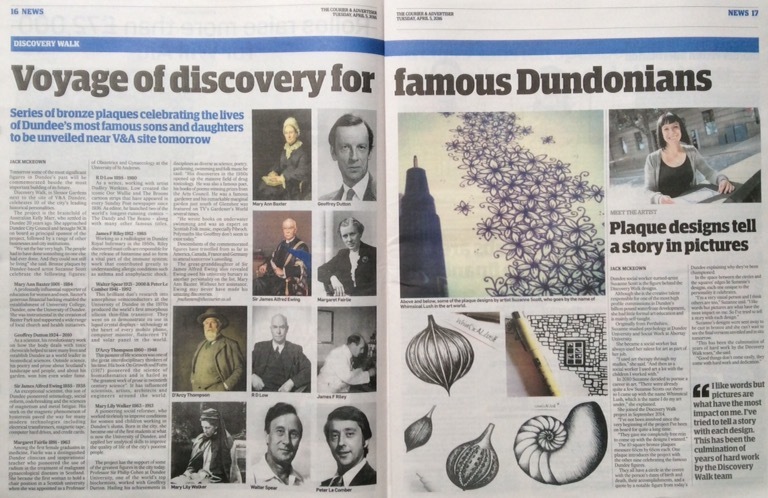 Some of the Thompson illustrations were featured in this double page spread in the Dundee Courier. I will leave you with this brilliant photo of Matthew Jarron (one of our Discovery Walk committee members) at D’Arcy Thompson’s plaque on the day of the unveiling. I think you would struggle to find a bigger champion of D’Arcy.. and what he doen’t know about him through his own work at Dundee University Museum Services and curating the Zoology Museum probably just isn’t worth knowing! Hope you have enjoyed finding out a bit more about how I went about creating D’Arcy’s bronze plaque for Discovery Walk, it was, along with all the others, an amazing wander through history… also biology, mathematics, botany, zoology and the rest too! For more about Discovery Walk and the other wonderful people included on it please pop over to the Discovery Walk page.